In my blog series regarding SAS REST APIs (you can read all of my posts on this topic here) I outlined how to integrate SAS analytical capabilities into applications. I detailed how to construct REST calls, build body parameters and interpret the responses. 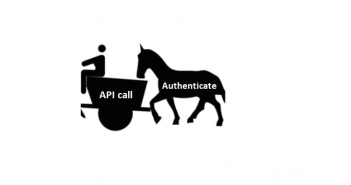 I've not yet covered authentication for the operations, purposefully putting the cart before the horse. If you're not authenticated, you can't do much, so this post will help to get the horse and cart in the right order. 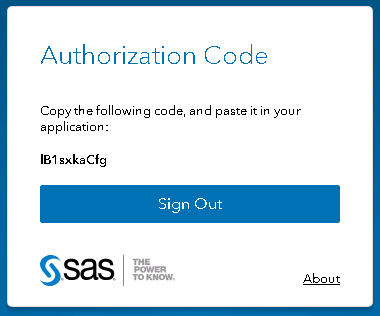 While researching authentication I ran into multiple, informative articles and papers on SAS and OAuth. A non-exhaustive list includes Stuart Rogers' article on SAS Viya authentication options, one of which is OAuth. 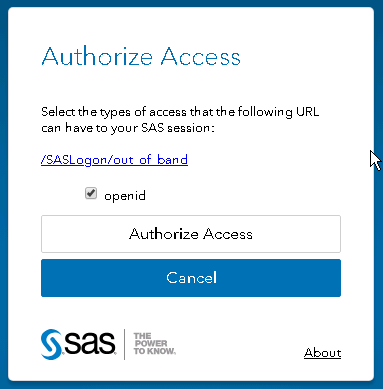 Also, I found several resources on connecting to external applications from SAS with explanations of OAuth. For example, Joseph Henry provides an overview of OAuth and using it with PROC HTTP and Chris Hemedinger explains securing REST API credentials in SAS programs in this article. Finally, the SAS Viya REST API documentation covers details on application registration and access token generation. Consider this post a quick guide to summarize these resources and shed light on authenticating via authorization code and passwords. What OAuth grant type should I use? Choosing the grant method to get an access token with OAuth depends entirely on your application. You can get more information on which grant type to choose here. This post covers two grant methods: authorization code and password. Authorization code grants are generally used with web applications and considered the safest choice. Password grants are most often used by mobile apps and applied in more trusted environments. Call the SAS Viya API using the access token for the authentication. This process requires multiple roles. A SAS administrator performs steps 1 and 2. A script or app provides the URL to an end user for step 3. The end user comes back with the authorization code and plugs it back into the script or application, so it can continue. Registering the client and getting the authorization code (steps 1,2, and 3) are one-time processes. The access and refresh tokens (step 4) are created once and only need to be refreshed if/when the token expires. Once you have the access token, you can call any API (step 5) if your access token is valid. Change the client_id, client_secret, and scopes in the code below. Scopes should always include "openid" along with any other groups this client needs to get in the access tokens. You can specify "*" but then the user gets prompted for all their groups, which is tedious. The example below just uses one group named "group1". Place the following URL in a browser. Change the hostname and myclientid in the URL as needed. The browser redirects to the SAS login screen. 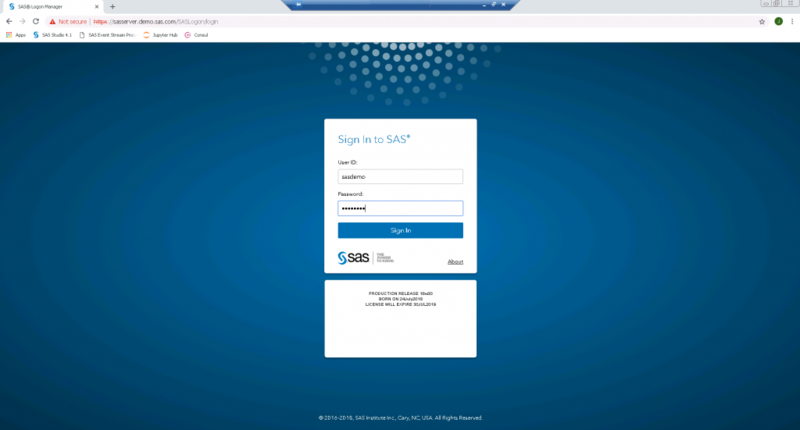 Log in with your SAS user credentials. On the Authorize Access screen, select the openid checkbox (and any other required groups) and click the Authorize Access button. After submitting the form, you'll see an authorization code. For example, "lB1sxkaCfg". You will use this code in the next step. Now we have the authorization code and we'll use it in the following cURL command to get the access token to SAS. We use the returned token to authenticate and authorize the calls made between the client and SAS. We also get a refresh token we use to issue a new token when the current one expires. This way we can avoid repeating all the previous steps. I explain the refresh process further down. We will again create environment variables for the tokens. The prep work is complete. We can now send requests to SAS Viya and get some work done. Below is an example REST call that returns the top level folders. $ curl -k https://sasserver.demo.sas.com/folders/folders?filter=isNull(parent) -H "Authorization: Bearer $ACCESS_TOKEN"
-H "Content-Type: application/x-www-form-urlencoded" -u "app:appclientsecret" -d "grant_type=refresh_token&refresh_token=$REFRESH_TOKEN"
Note the access token is new, and the refresh token remains static. Use the new token for future REST calls. Make sure to replace the ACCESS_TOKEN variable with the new token. Also, the access token has a default life of ten hours before it expires. Most applications deal with expiring and refreshing tokens programmatically. If you wish to change the default expiry of an access token in SAS, make a configuration change in the JWT properties in SAS. The steps to obtain an access token with a password are the same as with the authorization code. I highlight the differences below, without repeating all the steps. The process for accessing the ID Token and using it to get an access token for registering the client is the same as described earlier. The first difference when using password authentication is when registering the client. In the code below, notice the key authorized_grant_types has a value of password, not authorization code. The client is now registered on the SAS Viya server. To get the access token, we send a command like we did when using the authorization code, just using the username and password. -H "Content-Type: application/x-www-form-urlencoded" -u "sas.cli:" -d "grant_type=password&username=sasdemo&password=mypassword"
From here, sending requests and refreshing the token steps are identical to the method explained in the authorization code example. At first, OAuth seems a little intimidating; however, after registering the client and creating the access and refresh tokens, the application will handle all authentication components . This process runs smoothly if you plan and make decisions up front. I hope this guide clears up any question you may have on securing your application with SAS. Please leave questions or comments below. Joe, a Developer Advocate at SAS, acts as a liaison for the developer community to SAS technologies. His enjoys chronicling his journey as he learns SAS and open source integration. Joe comes to SAS with a software development and testing background. Step 4 "app:appclientsecret" should be "myclientid:myclientsecret" if you want to be consistent with Step 2. Thanks for reading and finding my copy/paste oversight. I have made the suggested correction. How to delete a client_id? Tried to send method DELETE to /SASLogon/oauth/clients but it says it only accept GET and POST. Thanks for reading the post and for your question. In order to delete the client_id, you need to include the client_id in your REST call. Something along the lines of http://sasserver.demo.sas.com/SASLogon/oauth/clients/client_id using the DELETE method.